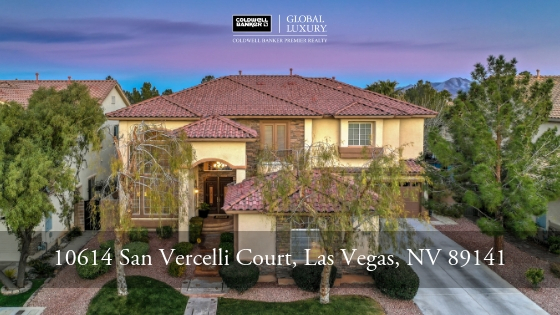 Are you searching for a remarkable home in Southwest Las Vegas located within a master-planned community with numerous amenities which is perfectly designed to entertain family and friends? 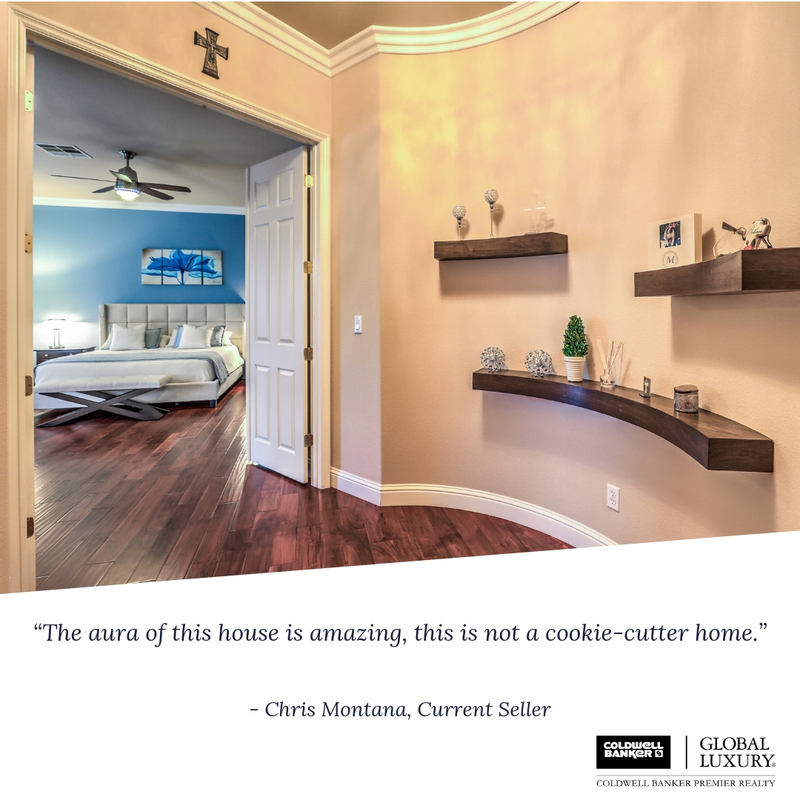 Then look no further than this brilliant new listing from Vanessa Hamrick of Coldwell Banker Premier Realty’s Luxury Collective. This sophisticated two-story, single family home spans 4,043 square feet and features four bedrooms, 3.5 bathrooms, loft and a four-car tandem garage. 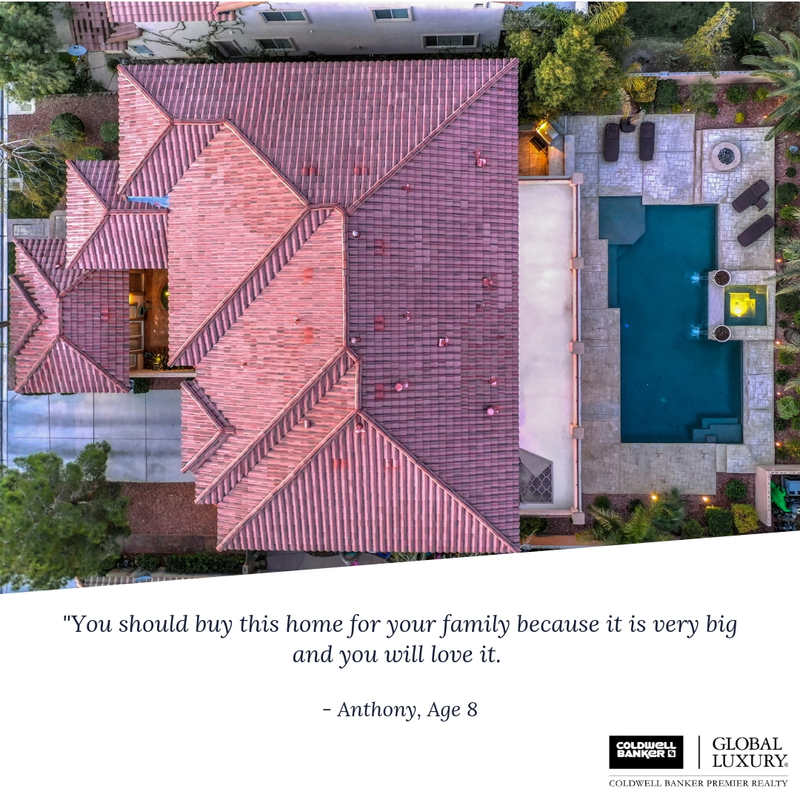 The front courtyard includes a charming water feature and a private, detached, 300 square-foot casita with upgraded bathroom which is ideal for a multi-generational household. The front and back exterior of the home showcases extensive stone work and tons of curb appeal. Situated on a large lot of over 15,000 square feet, this property presents a picture-perfect backyard with sparkling salt-water pool, heated spa, built-in outdoor kitchen with granite counter-tops, built-in stone fire pit, extended covered patio, and mature landscaping for privacy. This stunning gathering space is truly the heart of the residence where guests can socialize, eat, and play while enjoying the gorgeous Las Vegas weather year-round. The salt-water pool is 20’ x 40’ and 9.5’ deep with Pebble Tec® finish and in ground cleaning system. It has been well-maintained and was specifically designed by the seller for which children to play. 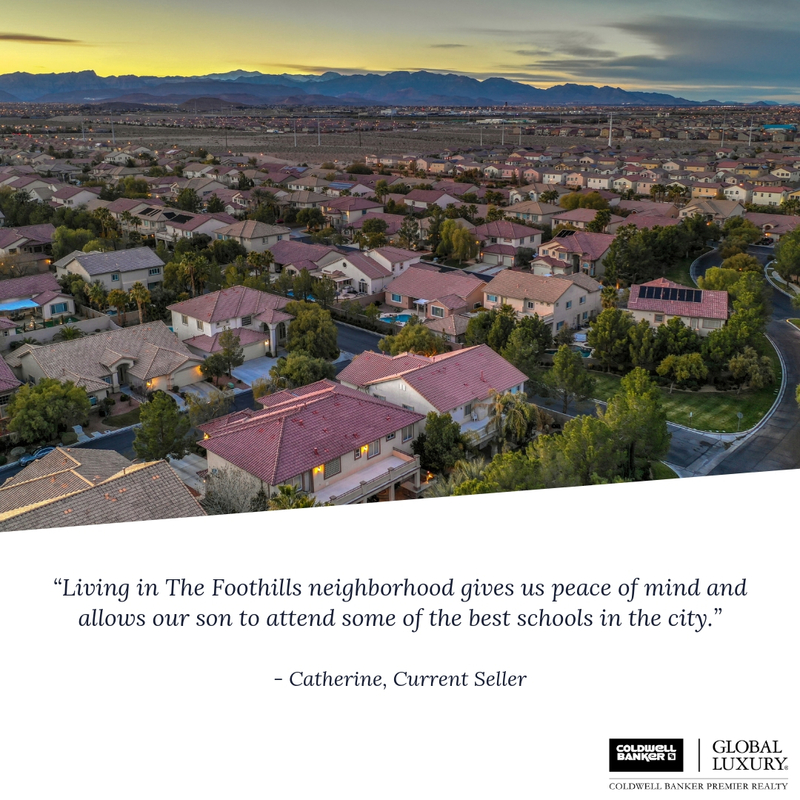 Located inside The Foothills at Southern Highlands, an affluent, guard-gated neighborhood, this cul-de-sac residence is within walking distance to a beautiful community park with playground, splash pad, and barbeque grills. The neighborhood often hosts gatherings at the park for most holidays as well as coordinates community garage sales. The popular master plan of Southern Highlands has been voted Best of Las Vegas two years in a row. 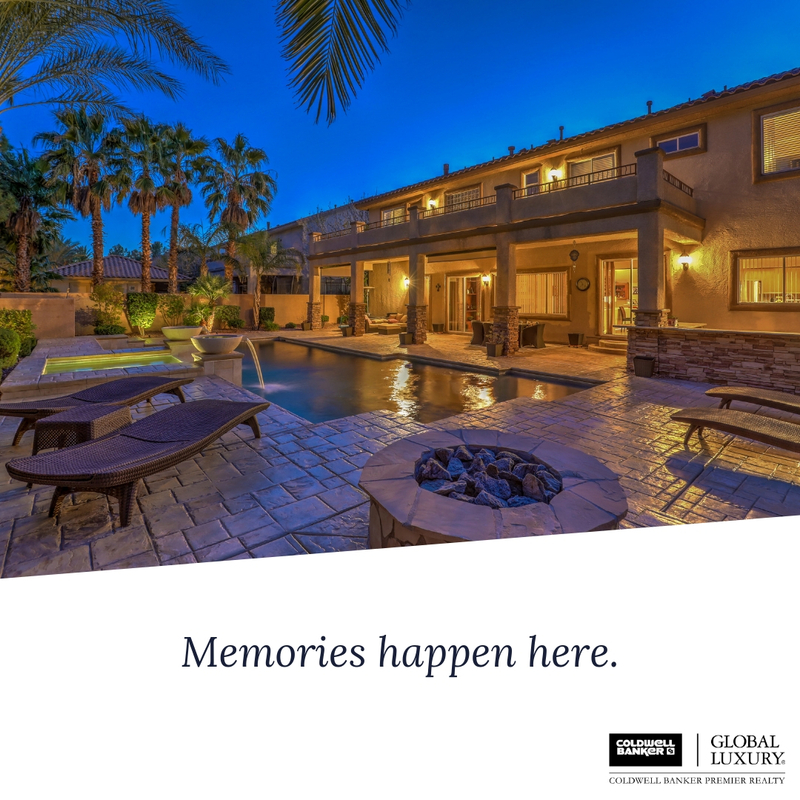 It’s nestled only ten miles from the world-famous Las Vegas Strip offering easy access to T-Mobile Arena and the Raider’s new Las Vegas Stadium; plus it is only minutes from local favorite, M Resort Spa Casino. Southern Highlands is home to one of the top, private golf clubs in the country, Southern Highlands Golf Course. The community also features many parks and walking trails, retail centers, family-owned restaurants, and its own 24-hour roving security patrol. Evelyn Stuckey Elementary and Charles & Phyllis Frias Elementary, located in Southern Highlands, were both listed as one of Niche’s 2019 Best Public Elementary Schools in Nevada and received four- and five-star rankings respectively from the Nevada School Performance Framework for 2018. Southern Highlands Preparatory is a nearby private school offering pre-K to eighth grade classes. There are so many things to love about this fun and charismatic home. Custom built-ins with lights have been added along with new wood flooring upstairs, and stainless steel appliances in the gourmet kitchen. The open floor plan invites plenty of dancing when Catherine’s family from Columbia comes to visit. Another favorite feature in this handsome home is the master bedroom. The generous area leads to a substantial extended balcony overlooking the lush backyard. It benefits from a convenience door connecting the master to a secondary bedroom; a perfect feature for families with young children. The master bedroom also includes walk-in closet, fireplace, soaking tub, separate shower, and dual sinks. The Montana family is sad to leave this incredible home but they won’t be going far. They have already purchased another home inside Southern Highlands. Written by Melissa Fama-Flis, Senior Director of Marketing.